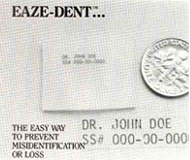 Eaze-Dent is the easy way to prevent misidentification or loss. First, snip off a piece of Eaze-Dent™ plastic ID film. Then, with a typewriter or just about any pen or marker, type or write your patient's ID information on it. Now, heat it only to 300 or 400 and watch it shrink to size. Cut away a layer of appliance, set ID in and coat with acrylic. That's it. You've just used what we think is the quickest, easiest, clearest, most economical, and most reliable identification system there is. Four 8" x 51/2" sheets come in each package of Eaze-Dent™.